Ya Jagoff!!! | More Aloha Jagoffery! Home Hawaii Social Media Summit More Aloha Jagoffery! Anyone remember the old “Oh! I must be in the front row!” Miller Lite commercial? If you don’t, of course, we have it for ya (below). Below are the tweets that came with the photo. thank goodness she kept her right turn signal on. I think the best part of this Jagoff Catch, is that our Jagoff Catcher is just kinda sitting there sipping on their Starbucks enjoying the jagoffery in process while sipping on some kind of Lotta-Crappa-Lotta drink as opposed to being behind them, yelling, kicking the floor board, punching the horn and screaming (like I would have done!) This is evidenced by the drink stirrer highlighted by the Jagoffestrator. Lady… a little walk does EVERYONE good! You ain’t as important as you think you are. You’re no different than those Red Box peeps who thinks they are “gonna be just a minute” but then spend 15 minutes blocking an area while they peruse the movie menu. 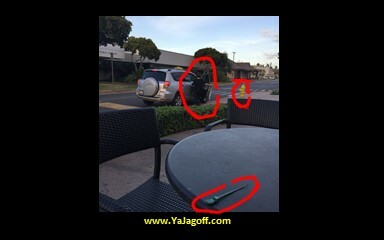 Go park in the parking lot… your fit bit will LOVE you for it, YaJagoff!!! Mahalo to @libbunnie on twitter, AGAIN, for being today’s Jagoff Catcher!